I loved this outfit that Kendall Jenner had on. 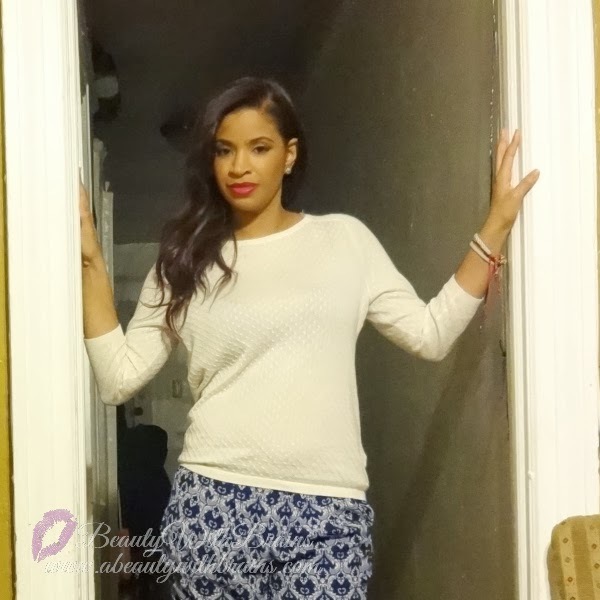 The sweater and the printed pants is a fresh look for the winter season. I decided to wear an outfit inspired by this look to a holiday mixer. I went for a paisley print on my pants since I'm not a fan of plaid. I got these at Forever 21 for less than $20.00! This whole outfit is a steal, actually. I love the loose fit of the pants, they're so comfy and I had room to wear leggings under since it was kind of chilly out. The pants are no longer available, but I provided links for similar styles under the photos.